I have a weird situation with the wiring in a switch box. I am adding a ceiling fan to the room and would like to replace the existing switch which powers an outlet with a double switch. One that powers the half outlet and one that powers the ceiling fan. The problem is I don't think there is a neutral in the box. There are two Romex 14/2 wires coming into the box. 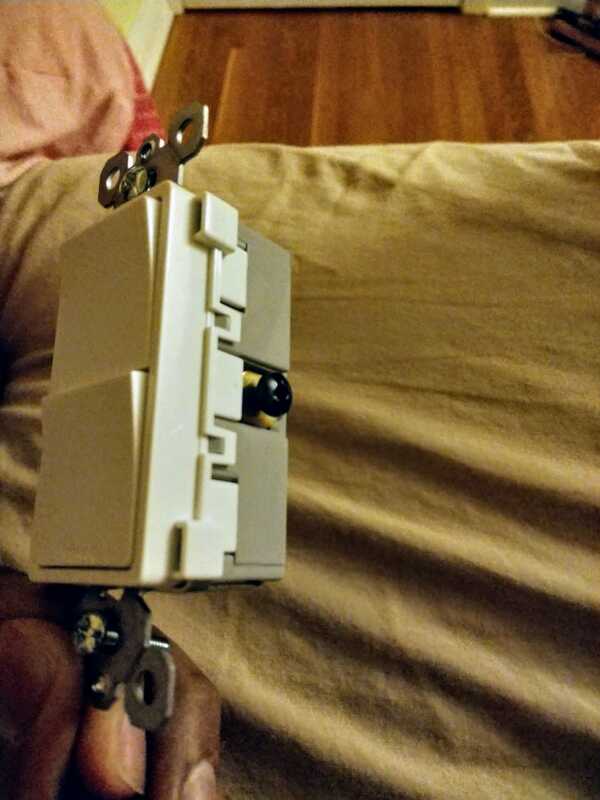 The 2 blacks are nutted together and pigtailed to one screw and the two white wires are joined together to the other screw. I know that this current setup switches on one of the outlets in the room and then electricity passes on to power the outlets in the next room. I am not able to figure out the wiring that needs to be made to power the fan. Here are the pics of the switch I would like to use. You evidently do not have a neutral in the switch box. The white wires attached to the switch are not neutrals but are either line hots or "switched hots" (the latter become hot when the switch is closed). The whites attached to the switch should have been marked with black tape to signify that they are repurposed hots. You can tell if the white are line hot or switched not by whether they are switched or not. In your top pic there is a white and a black going up. Is this new cable you brought in to go to the fan? What you would have to do is bring in another cable with neutral and hot in the attic into the ceiling box for the fan. The neutral would be connected directly to the neutral lead of the fan. The hot would be connected to one of the wires in the cable you pulled to the switch box. This would give a hot in the box which would be properly paired with a neutral. The other wire in the cable in the switch box would be switched hot. In the ceiling box the switched hot would be connected to the hot fan lead. EDIT The double switch you show could not be used to switch the fan by the method I describe because it has a common line hot connection. 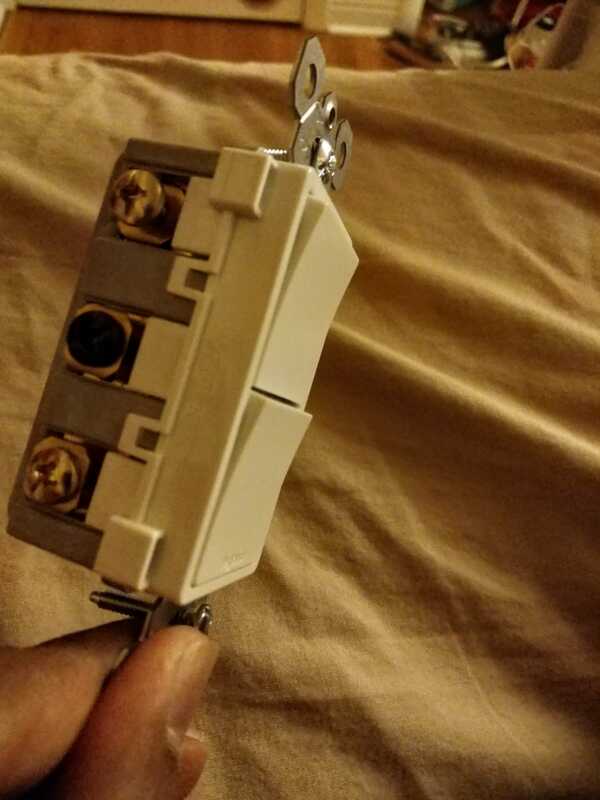 You would need a double switch that has two independent line hot connections. You've got a couple of issues here. First, who ever installed that neutral on the switch twisted the wire the wrong way. The wire should always be looped clockwise, or in the same direction you'd turn to tighten the screw. That way, when you go to tighten the screw, the wire is pulled closer, rather than pushed farther away. That is rookie electrical knowledge. That tells me someone who didn't know what they were doing wired this up. I'm not sure those white neutrals should even be on the outlet but I'm not an electrician so don't take my word for it. However, you also mentioned "continuous outlets in the next room over lose power as well" which you did not describe in your original question but I can only assume is an additional outlet branched off from the outlet in question that loses power whenever the outlet in question does. I'm not sure why that is an issue or what you want to change about that, if anything. Sounds like you want to wire up the outlet in a split configuration. If this were my house, I'd call an electrician, hear me out. I know everyone online tells you to hire an electrician to change a light bulb or you'll burn your house down. That is not what I am saying at all. Normally this type of job is something home-gamers like us can tackle and save a ton of money. The reason I'd call an electrician is back to my first point. You had a home-gamer that didn't do his homework make changes to your electrical system. Just because everything is fine now doesn't mean there aren't all kinds of abominations hidden in the wall that you cannot see. 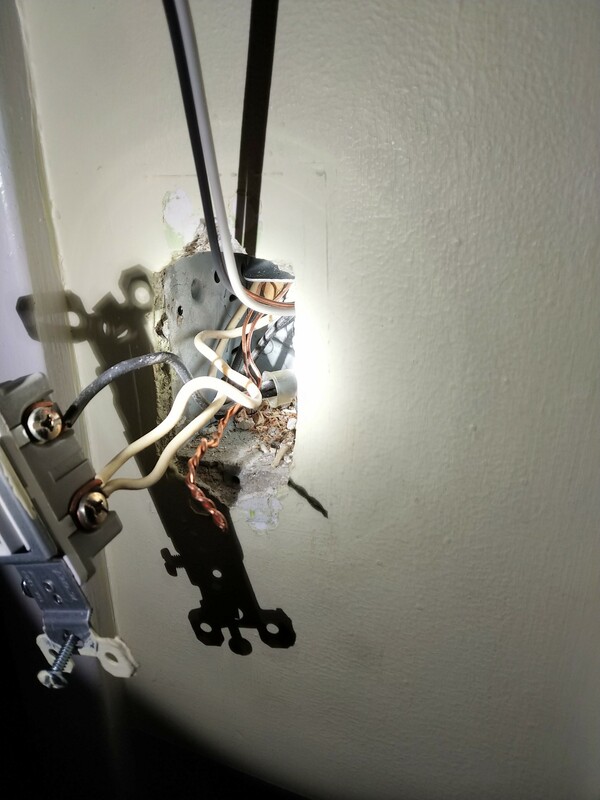 I would hire the electrician to not only sort out the switch and fan issue, but to inspect the rest of my wiring and make sure who ever worked on that switch before you only made the simply fixable error we can see. Otherwise you may be in for adventure time every time you open up a junction box. Not to mention if you ever want to add home automation to your house a working neutral wire is pretty essential. Good luck to you regardless. Stay safe and use a non-contact voltage tester. Not the answer you're looking for? Browse other questions tagged electrical switch receptacle ceiling-fan or ask your own question. What to do about hot neutral in switch? Wall Outlet with three sets of wires! Why doesn't my ceiling fan's light kit work?